The YaST team is working hard in order to extend the installer, improve the new storage layer and get rid of some bugs. So after this sprint, there is quite some unfinished work that will be ready within two weeks. Snapper takes the free space into account when cleaning up snapshots. 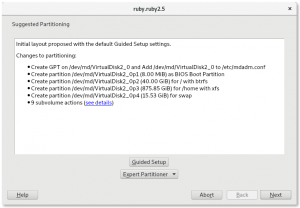 The partitioning proposal tries to use just a single disk first. 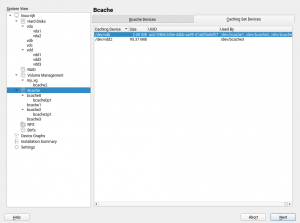 The description of those actions that are related to BCache and MD-RAID devices have been greatly improved. YaST is now able to handle repository variables properly. The log viewer displays a helpful message when no logs are found. 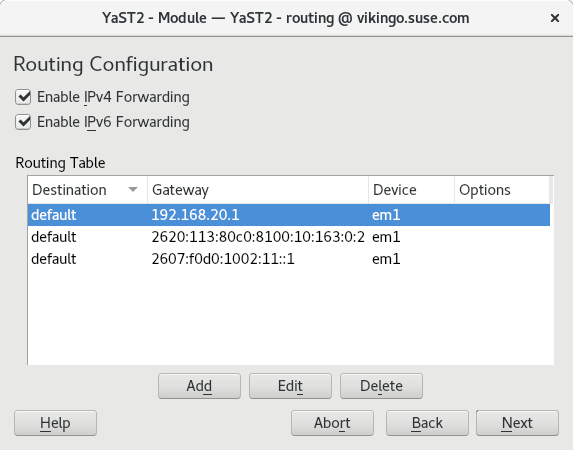 And last but not least, yast2-sshd got a new maintainer outside of the YaST team. Let’s celebrate! So far snapper would delete snapshots if the overall spaced used for them was above a given limit. Now, snapper is able to take the free space into account too, so it will delete snapshots when the free space of the filesystem drops below a given threshold. Of course, the threshold can be adjusted by the user through the snapper configuration files. However, YaST2 had some problems in these situations that, hopefully, have been fixed during this sprint. 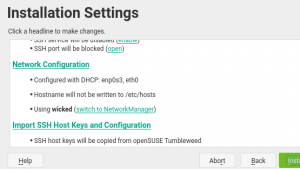 Now openSUSE release managers can adjust the list of online repositories in order to take advantage of such a feature. If you want to know more about variable substitution, please check libzypp documentation. 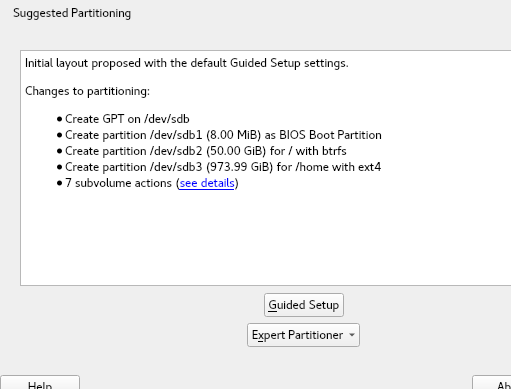 Until now, the partitioning proposal that is calculated during the installation uses all available disks by default. However, according to the feedback that we have received from our users, most people simply expect the system to be installed in just one disk. So, from now on, this initial proposal will consider each candidate disk in isolation before falling back to a multi-disk approach. A picture is worth a thousand words, so just compare the images below to see the difference on a system which has three hard disks. YaST has featured a log viewer for a long time which allows the user to inspect files under /var/log like messages, boot.log or even YaST logs (YaST2/y2log). However, we are already in the Systemd times and most of your system services will log relevant information to the Systemd journal. For that reason, YaST2 offers a really nice log viewer for (yast2-journal) which includes interesting filtering capabilities. The problem is that, as one of our users stated in a rather old bug report, having two different tools to check logs can be confusing. Of course, they are getting information from different places so we decided to keep both of them. However, now the old log viewer will show a hint when no information is found in those old-style logs. 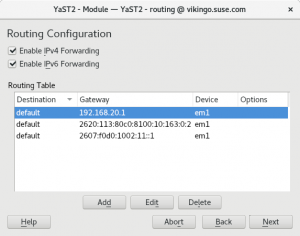 We would like to finish this report announcing that yast2-sshd has a new maintainer outside of the YaST team. This module was dropped back in 2013 and it was shipped in openSUSE 12.3 for the last time. However, YaST is open source and Caleb Woodbine has built fresh RPM packages after fixing a problem he found in the firewalld integration. So if you are interested in such a module, check out Caleb’s work. Snapper: list indicates special snapshots; what is snapper anyway? Booting: "warning, everything is fine!" For more details visit http://snapper.io/2018/10/18/show-special-snapshots.html. Previously, the module was called just "Snapper", but users who don’t know that Snapper is could not make any sense of that. We changed it to "Filesystem Snapshots". Funny anecdote: One team member asked if Snapper really supports LVM when he read the subtitle "Manage Btrfs / LVM filesystem snapshots". Yes, it does! (It has been doing that for a long time). You don’t need Btrfs for snapshots; LVM can also do that, albeit a little differently than Btrfs. On one hand, now it is possible to format and mount a whole disk without creating any partition. 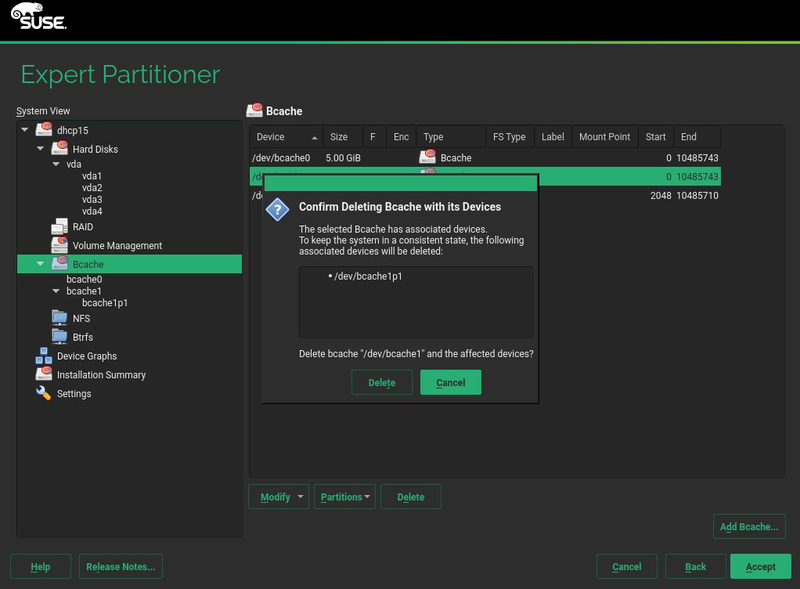 In order to do so, you only need to set the <disklabel> element to none and AutoYaST will understand that you do not want to partition the drive but to use the whole disk as a filesystem. 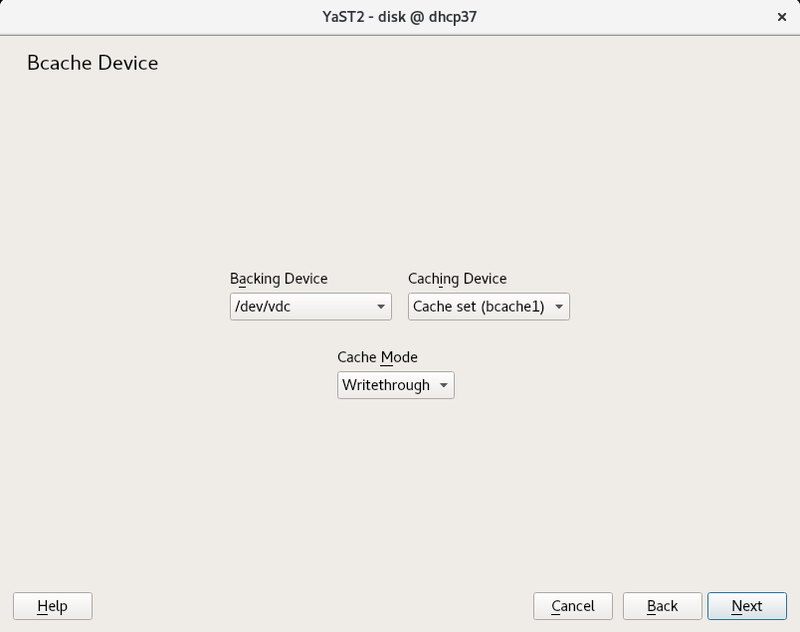 Given the definition above, AutoYaST will format the whole /dev/sdb disk mounting it at /home. But that is not all: it is even possible to use a whole disk as an LVM physical volume or as a software RAID member. 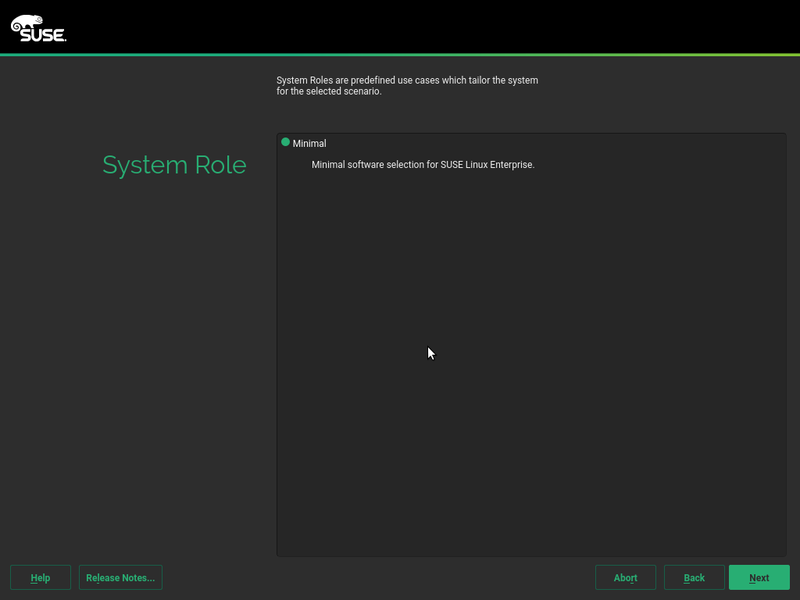 The support for the first case was already present in previous AutoYaST versions, but it was not working correctly in SUSE Linux Enterprise 15 and openSUSE Leap 15. AutoYaST is now able to create partitioned software RAIDs, something that was not possible in pre-storage-ng times. However, in order to support such a scenario, we needed to change the way in which software RAIDs are described in AutoYaST profiles, although the old format is still supported. So let’s have a look at how a RAID looks like now. Of course, if you do not want the RAID to be partitioned, just set the <disklabel> element to none, as for any other device. 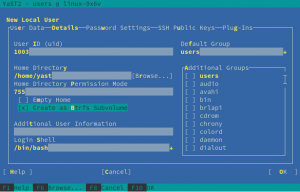 Analogous to how software RAIDs were defined in AutoYaST until now, Xen virtual partitions with a similar name were grouped in the same <drive> section. It means the /dev/xvda1, /dev/xvda2, etc. were defined within the <drive> section for xvda, which does not exist at all. 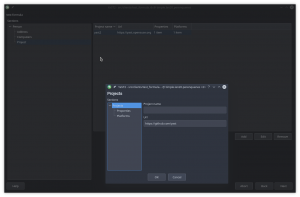 AutoYaST rules offer the possibility to configure a system depending on system attributes by merging multiple control files during installation. Check the Rules and Classes section for further documentation. 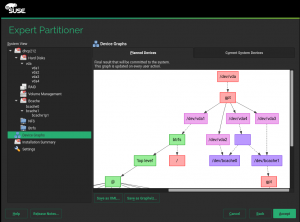 The merging process is often confusing for people, and the sections in the merged XML files must be in alphabetical order for the merge to succeed. AutoYaST was cleaning the profiles after a merge, but if the resultant profile was merged with another profiles that profiles were not cleaned before the merge. That was confusing and error prone, so we have fixed it cleaning also them before the merge. 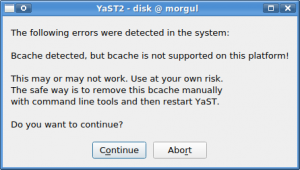 As our readers know, one of the main goals of yast-storage-ng was to offer a more reliable and precise diagnosis on what partitions need to be created in order to ensure that a new system being installed will be able to boot. If something doesn’t fit with such diagnosis, the installer shows a warning message. 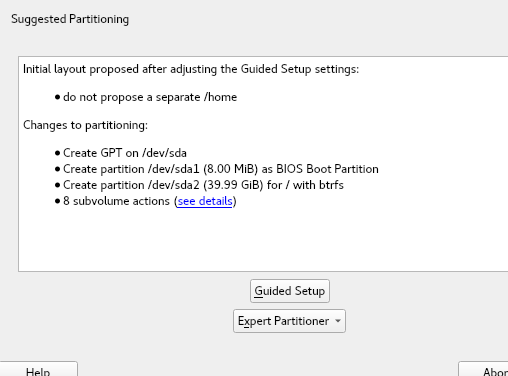 In the case of booting a system installed in a GPT device, using the legacy BIOS system (as opposed to EFI), that means SLE-15 and openSUSE Leap 15.0 will warn the user if there is no partition of type BIOS Boot. But there are two problems with that. The warning messages from the Partitioner and, specially, from AutoYaST don’t do a great job in explaining what is wrong. 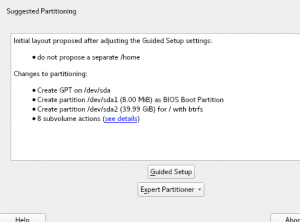 Some users have reported they have GPT systems booting fine in legacy mode without a BIOS Boot partition and, thus, our diagnosis in such cases may be wrong. We even had a comment in our source code reinforcing the second point! So we tried to fix our wrong diagnosis… just to end up realizing it was in fact right. 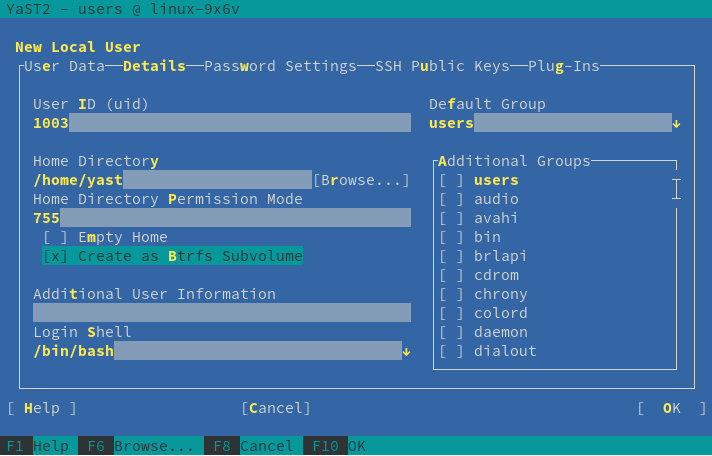 After carefully evaluating all the possible setups, checking the different specifications, the Grub2 documentation and even checking the Grub2 source code, we found that layouts without a BIOS Boot partition could get broken (resulting in a non-bootable system) by some file-system level operations. So only the configurations including a BIOS Boot partition can be considered to be 100% safe, both in the short term and against future changes in the system. We simply cannot allow our users to fall into traps without, at least, a warning message. So we kept the behavior as it was and we focused on improving the messages. After all, advanced users knowing the risks can ignore such warnings. This is how the new warning look in the Partitioner of the upcoming SLE-15-SP1 (and, thus, in openSUSE Leap 15.1). And this is what AutoYaST will report if the profile doesn’t specify a BIOS Boot partition and it’s not possible to add one to the layout described by such profile. 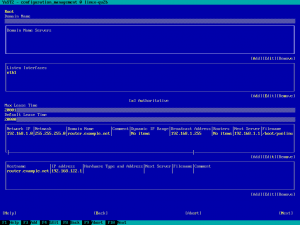 All-in-one dialog of CaaSP installer asks for NTP Servers. Up to now it searched for NTP servers using SLP only. Otherwise only manual configuration was possible. Since now CaaSP installer parses DHCP response and fetches NTP servers if any was provided. NTP Servers obtained from DHCP are preferred over those discovered via SLP. We noticed that clicking around the partitioner UI feels slow. So we used the built-in (Y2PROFILER=1) as well as an external (rbspy) profiler to pinpoint the places that need optimization (mostly caching). Can you see a difference in the following screencast? Another two weeks of development, another report from the YaST team. During this sprint, we have been working to improve the usage and installation experience in many areas, including but not limited to the following. Improvements in several areas of the Partitioner. Better integration of the new Firewall UI with AutoYaST. Improvements in roles management and in the roles description. 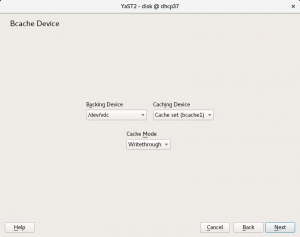 Better support in YaST Firstboot for devices with no hardware clock, like Raspberry Pi. We have explained already in several previous posts how we were struggling to come up with a set of changes to the user interface of the Partitioner that would allow to expose all the new functionality brought by storage-ng, while still being familiar to our users and fitting in a text console with 80 columns and 24 lines. We finally implemented the interface described in this gist, which fits into a 80×24 text console and allows all kind of operations. Check that document for more info about the behavior and its rationale. But what does “all kind of operations” mean? For example, it means it’s possible to start with three empty disks and end up creating this complex setup using only the Partitioner. In that example, /dev/md0 is an MD RAID defined on top of two partitions and formatted as “/”. Nothing impressive here so far. /dev/md1 is an MD RAID defined on top of a combination of full disks and partitions. Using disks as base for a RAID was not possible in the old Partitioner. Even more, /dev/md1 contains partitions like /dev/md1p1 and /dev/md1p2, another thing that the old Partitioner didn’t allow to configure. 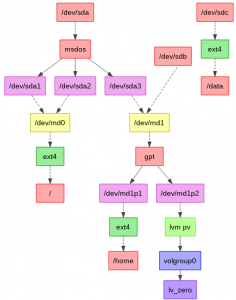 /dev/volgroup0 is an LVM VG based on one of those MD partitions, allowing to combine the best of the MD and LVM technologies in a new way. Last but not least, /dev/sdc is a disk formatted to host a file-system directly, with no partitions in between (also a new possibility). The general approach of the new UI is described in the linked document. But since an image is worth a thousand words (and an animation is probably worth two thousands), let’s see how some part of the process to create the complex setup described about would look in a text console. 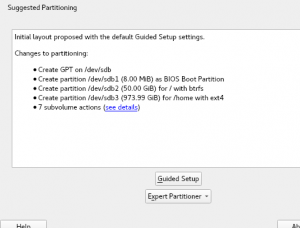 This is how you can now directly format a disk with no partitions. 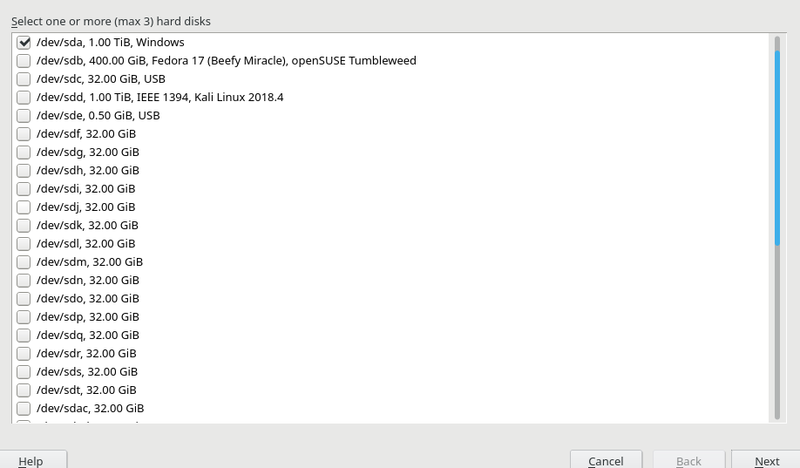 Playing with the partitions of a disk is also a good way to get a feeling on how the buttons are now organized and how they dynamically change based on which row is selected in each table. Click on the following image to animate it and see those views in action. And for a full experience of completely new stuff. 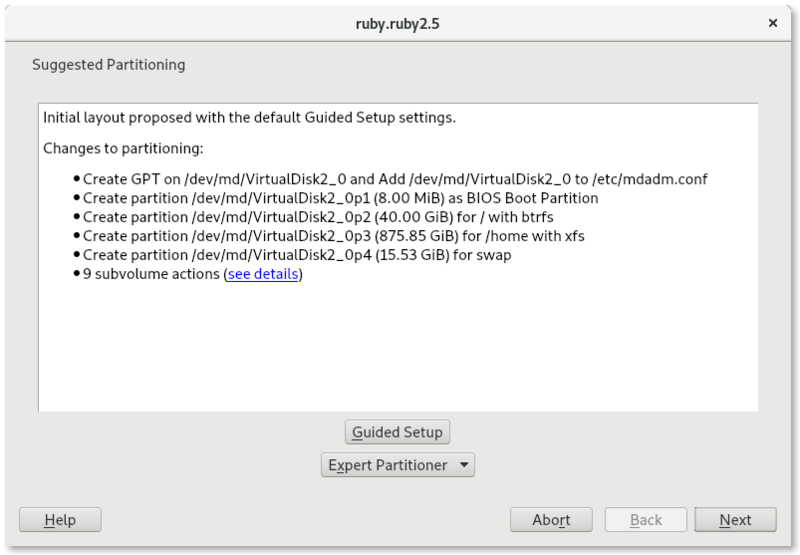 Click on the image below to see an animation showing the whole process of creating an MD RAID on top of two full disks and then creating partitions within the resulting RAID. But although the text mode is the limiting factor to design a YaST UI, many users install their systems and use the Partitioner in graphical mode. For those wondering how the reorganized buttons look in that case, here are some screenshots of the installation process of the upcoming SLE-15-SP1 (static screenshots this time, we already had enough animations for one post). Surely most Partitioner users have recognized the style of the visual representation used above for the complex example setup. As you know, the Partitioner offers similar representations in the “Device Graphs” section, both for the original layout of the system and for the target one. 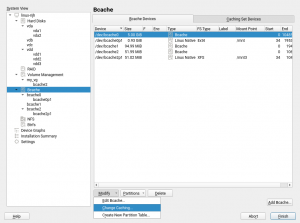 After adding support for Bcache to the Partitioner we detected a small but annoying problem in those graphs. 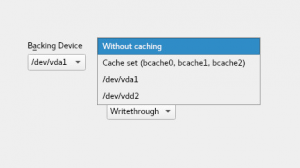 The caching devices were using their UUID as labels, which had two drawbacks. So know we use a fixed “bcache cache” label for all cache sets, which looks like this. As opposed to the old way with empty boxes. And since we mention the Bcache support in the Partitioner, it’s worth noticing that the implementation continues moving forward at good pace. 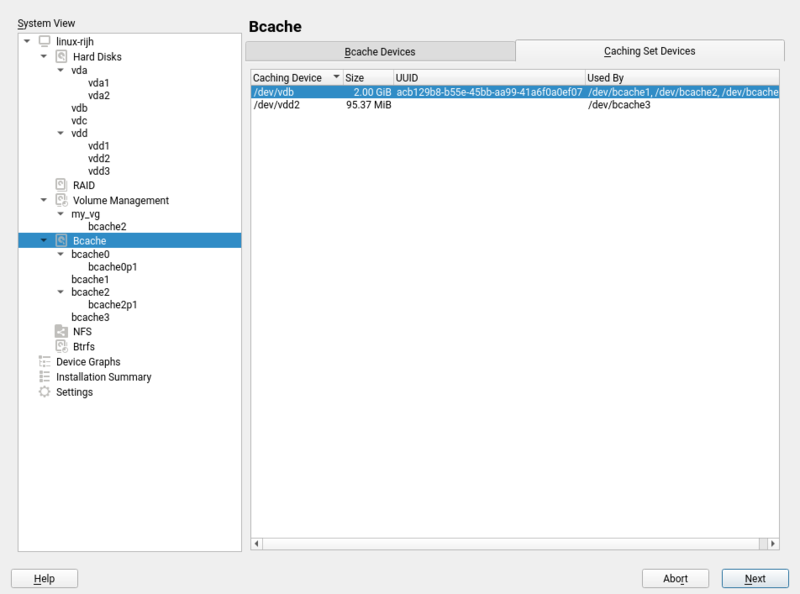 During this sprint we implemented a first version of the operations to add a new Bcache device and to delete it. When adding a new device, the only options that can currently be defined is which devices to use to construct it. But the next sprint has started and you can expect more options to be supported in the near future. 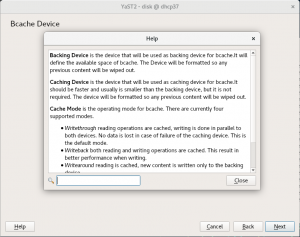 When the Bcache device is created, then it can be formatted, mounted or partitioned with the same level of flexibility than other devices in the system. So soon (after the usual integration and automated testing phases) Tumbleweed users will be able to use the YaST Partitioner to test this exciting technology. 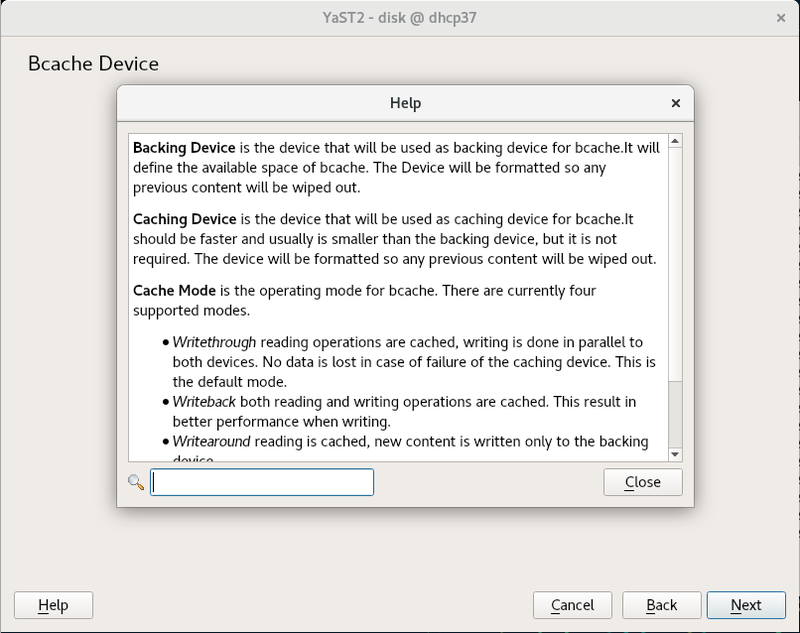 Of course the operation to delete a Bcache device offers the usual checks and information available in other parts of the Partitioner, like shown in the following screenshot. 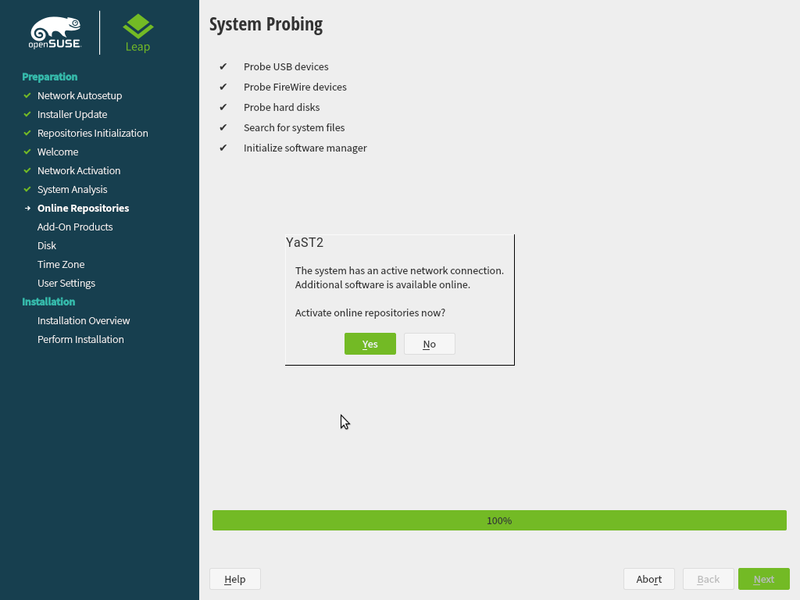 Both screenshots are taken with an updated version of the installer of the upcoming SLE-15-SP1, since this functionality will be available in such distribution and, of course, also in openSUSE Leap 15.1. As those following our blog already know, the YaST Team is also somehow responsible for the development and maintenance of Snapper, the ultimate file-system snapshot tool for Linux. And Snapper has also received some usability improvements during this sprint. For systems with btrfs and quota enabled, the output of “snapper list” now shows the used space for each snapshot. 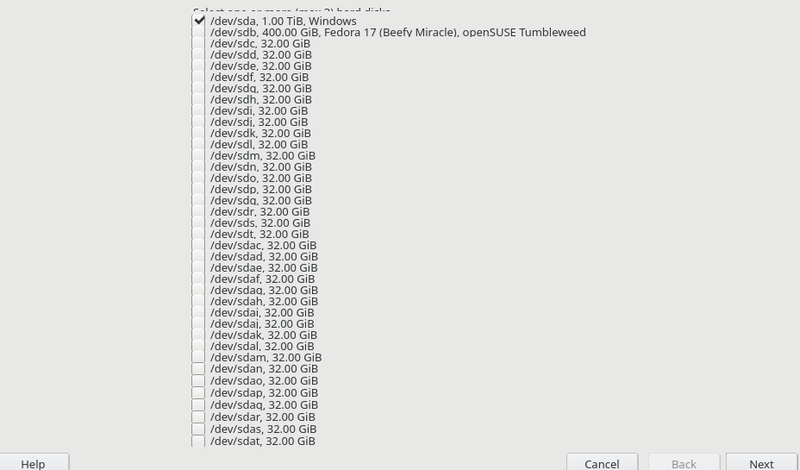 The used space in this case is the exclusive space of the btrfs quota group corresponding to the snapshot. For more details about this change, its advantages and limitations, check the new post at the Snapper blog. The role selection dialog in SLE-15 is always displayed in the installation workflow. However, it does not make much sense to display it if there is only one role to select. When you do not register the system and do not use any additional installation repository then in the default SLES-15 installation you can see only the minimal system role. In such case you cannot actually change anything as the only role is pre-selected by default and the only thing which you can do is to press the Next button. 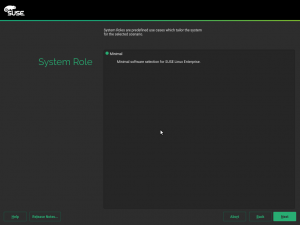 Therefore we improved in for SLE15-SP1, if there is only one role to select then the role is selected automatically and the dialog is skipped. In addition to that, many of the role descriptions have been adapted and simplified to, hopefully, be more clear. 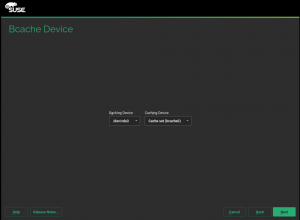 SLE and openSUSE can be installed on a great variety of devices, including some system that doesn’t include a hardware Real Time Clock, like the popular Raspberry Pi. That means the usual mechanism to establish the current date and time (using the hwclock command) fails in such devices. 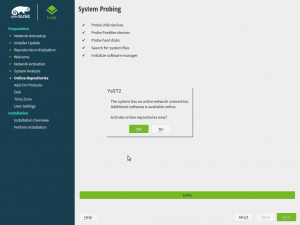 That general problem was detected during the usage of YaST Firstboot to configure new devices. So now YaST detects situations in which there is no Real Time Clock and uses the date as an alternative to set the date and time. 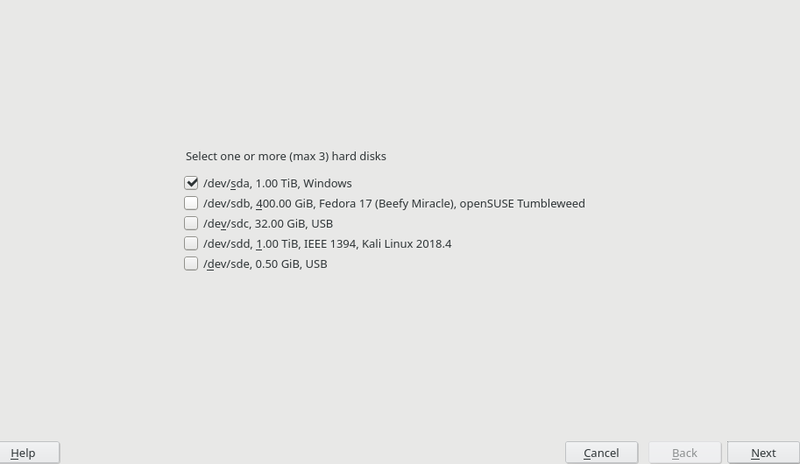 This fix, already submitted to openSUSE Tumbleweed, will be available in all upcoming versions of SLE (like SLE-12-SP4 and SLE-15-SP1) and openSUSE Leap. On the previous report we anticipated the new UI we are building for configuring Firewalld from YaST. During this sprint we have been focusing on some aspects that need to be finished before we can release this new functionality. 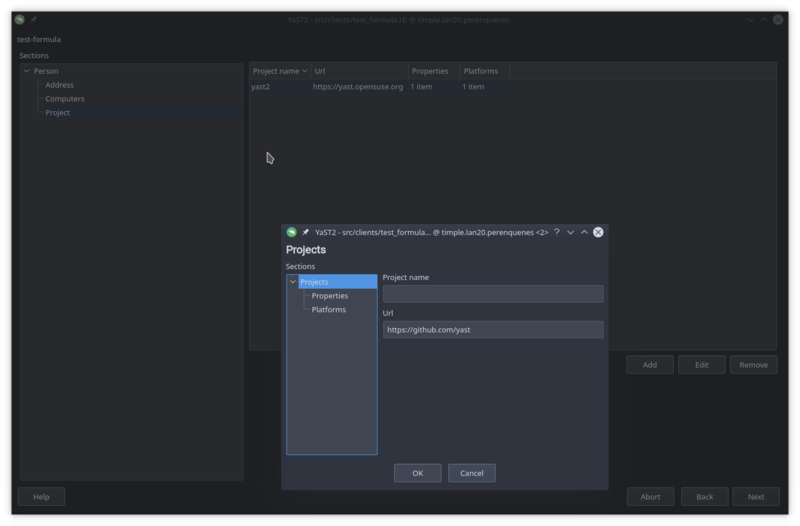 Now this UI can be invoked from the AutoYaST module in YaST, meaning it can be used to import and then fine tune the current configuration of the system so it can be exported to an AutoYaST profile. And since we are already in animation mood, check how the new UI can be used to define an AutoYaST profile. Very soon the whole functionality will be ready for prime time and we will release it together with a separate blog post to explain all the details. We are already working on the next sprint, with special focus on AutoYaST, on Snapper and on improving the installation experience in several scenarios. As mentioned above, it’s likely that you will get more news from us (about the new Firewalld support) even before that sprint is finished. But if you can’t wait for more news, don’t hesitate to visit us on our Irc #yast channel on Freenode. Otherwise, see you here again soon.